Moscow will not be taking any action in response to U.S. President Barack Obama's decision “to take a pause” in the relations with Russia. However, it will not be easy to avoid at least a partial freezing of contacts. Sources close to the State Department do not conceal the fact that this pause will be called off only if Moscow makes some concessions on sensitive issues, such as nuclear arms reduction and ballistic missile defense. Following Obama’s announcement that he would not be travelling to Moscow for bilateral talks with Russian President Vladimir Putin in September, the diplomatic relations between the two countries appear to be strained. As reported by Russian newspaper Kommersant, the Russian Ministry of Foreign Affairs did not exclude the possibility of some “demonstrative gestures” on the part of the Americans during an upcoming trip to Washington by the Russian Minister of Foreign Affairs Sergey Lavrov and the Russian Minister of Defense Sergei Shoigu for a 2+2 meeting with their American counterparts. It was not long before the first of such gestures - the cancellation of the traditional photo op with the participants - was performed. Subsequently, the Secretary of State John Kerry and the Secretary of Defense Chuck Hagel chose not to make any comments at all to reporters after the meeting. Yet, the speeches made by the two Russian ministers seem to suggest that there is no crisis in the relations between the two countries. Lavrov assured that the Russian Federation and the U.S. have similar positions on a number of issues, such as Afghanistan and their common interest in the preservation of stability in the country after the international coalition forces are withdrawn in 2014, Syria and the need for a second international conference on the issue, Iran’s nuclear program, the fight against the proliferation of weapons of mass destruction, space exploration and many others. According to Lavrov, Kerry agreed that the fate of the ex-CIA analyst and NSA whistleblower Edward Snowden, who has been granted asylum in the Russian Federation and was one of the reasons behind Obama’s decision to cancel his talks with Putin, “should not overshadow other issues being negotiated, or undermine the common interests of both countries”. Similarly, Shoigu asserted that he did not feel “any changes in the approaches to military cooperation” between the two countries because of the “Snowden case”. The main demonstrative act from the Americans took place while the cortege of the Russian delegation was on its way to Andrews Air Force Base for a flight back to Moscow. At a specially convened press conference, President Obama announced the necessity for a “pause” in relations with Moscow. He also complained that the return of Putin to the Kremlin has led to an increase in anti-American rhetoric in the Russian Federation and the revival of Cold War stereotypes. The head of the White House also made a personal comment about the Russian president. He expressed surprise that his Russian colleague often looked “like a bored kid in the back of the classroom” in photos from the meetings between the two presidents. “Obama has turned to personal attacks, which is absolutely unacceptable,” a Russian diplomatic source told Kommersant. “He said it was necessary to watch the development of the situation in the Russian Federation. What is there to watch? It would be better to come and talk to us”. The newspaper’s source implied that trust had developed between Lavrov and Kerry, so the sincerity of the words spoken by the head of the State Department about the development of bilateral cooperation should not be doubted. A source in the Russian Ministry of Foreign Affairs said that, despite the statements of the U.S. President, Moscow does not intend to take retaliatory steps that might have an impact on real interaction between the two countries. The Ministry of Defense also provided assurances that they are “in favor of the necessity to negotiate important issues, without regard to current differences in other areas”. “You cannot simply freeze all existing arrangements, especially on such issues as the European ballistic missile defense program and disarmament,” said the source. “If we interrupt our dialogue, the consequences will be tragic – we will be taking many steps backwards”. Surely, it will not be easy to move forward. “The words of the United States President do not mean that we will not work as before with Moscow, in areas where we have mutual understanding, or at least common interests – primarily Afghanistan, war on terrorism and drugs, as well as North Korea and Iran. 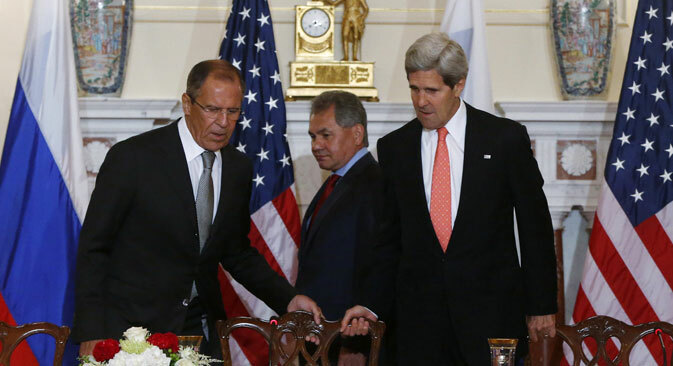 We will also continue the dialogue on Syria,” said a source close to the State Department. “However it is doubtful whether the White House will make new efforts to persuade the Kremlin to compromise on such key issues as the reduction of nuclear arsenals and ballistic missile defense in the foreseeable future. All we could offer here was set out in President Obama's April message to Mr. Putin. However, Moscow was not satisfied with any of the initiatives. Now the ball is in the Russian Federation’s court – if it does not want this ‘pause’ in relations to linger, then it should demonstrate a willingness towards productive cooperation. Summits for the sake of summits and relations for the sake of relations are not our way of doing business”.